Planting tomato plants into the garden. 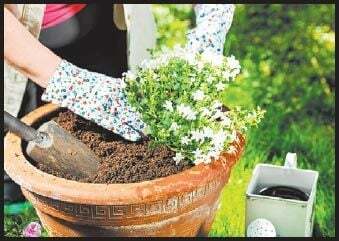 A woman plants a mixed container for the patio. Lilacs should be pruned immediately after flowering. "Is it Tuesday?" My son asks this question every morning, as he gets dressed for pre-school. Days of the week have little meaning in the lives of three year olds but Tuesdays are "Show and Share" days where he gets to bring something from home to show his teachers and friends. He just can't wait for Tuesday after Tuesday when he gets to bring yet another train, tractor or dump truck to wow his young peers. For the past few months, I have heard the adult version of this question over and over. "Is it spring yet?" The first truly sunny days, the first blooms of forsythia and magnolia, the first buds on the trees and the familiar roar of the lawn mower are all sign that spring is coming. Unfortunately, for gardeners those are all signs of what is coming, but the true starting line for planting in the garden is the official frost-free date. Our date, May 15, has just passed and that basically means that we are now unlikely to experience frost. Mother nature has given us the all clear. Now what? 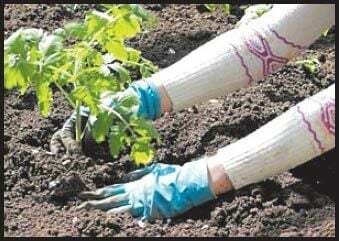 1) Plant your Veggies- All the veggie plants that you started indoors (or just recently purchased) can be planted outside. This includes heat-loving veggies like tomatoes and peppers. 2) Plant Container Gardens- If you haven't already, you can now safely plant your containers with flowering annuals, herbs and vegetables. Be sure you have drainage holes in the container, and use a reputable container mix or potting soil, not topsoil or garden soil. Lastly, get creative with color and texture and have fun with new combinations of flowers. 3) Get the Pruners Out- All those blooming shrubs that showed us spring was coming have finished blooming. After they have gone out of bloom, they need to be pruned and shaped before they begin to set their flower buds for next year. This is especially true of forsythia and lilacs. Other shrubs to prune include purple-leaf plum, flowering almond, weigelia and azaleas. 4) Roll out the green carpet- With all the planting fun, it would be easy to forget the grass except for it's constant need to be mowed. May temperatures are perfect for spreading grass seed, filling in bare spots and taking care of weeds before they get out of control. The green light is lit, frost is a thing of the past and you likely have more plans then time to do them. As you choose what to plant and where to plant it, don't forget to have fun and think about which of your garden projects you would be most proud to bring to "Show and Share" next Tuesday.